It's time for Prince Honorous Jorg Ancrath to return to the castle he turned his back on, to take what's rightfully his. The Empire is broken and has been for generations. Small kingdoms and fiefdoms battle one another continuously. Told from the first person perspective of Prince Honorous Jorg Amcrath aka the Prince of Thorns we see things from a decidedly dark and sometimes naive view since he is still a teen. But Jorg has not had a easy road. Who would be normal if they witnessed the murder of their mother and sister? Even if you don't like Jorg you'll understand his reasons for doing things his way. Prince of Thorns is the story of a teen matured by death and evil. It may in fact be far too dark and nihilistic for some, but for those that like bloody action you've plenty to look forward to. Yet it does have a YA feel to it caused by the seemingly young protagonist who has seen and done too much. Think Abercrombie minus any attempt at redemption and akin to Wolfe's Books of the New Sun for depraved teens. Some parts of the story don't seem believable at first such as a 14-year-old leading a band of outlaws, but through the sly use of flashbacks all the pieces fall into place. Jorg has a cold passion for revenge. He is tired of people pulling his strings and has for the last few years gone out in the world to equip himself with the tools needed to prepare for what he sees as his future. The flashbacks themselves are what kept me going for the first half of the book as I wanted to see how Jorg's so called brothers fit together and were formed. But don't get too attached as death comes to many during the course of the story. This is a quick moving story with very short chapters that is apt to call a page turner with surprisingly believable action sequences that fit in with the characters as they like to fight dirty. Prince of Thorns was far from a perfect novel as some things are left just too sketchy, but it grabbed me in a way that is hard to articulate. And there is certainly plenty of time left for Lawrence to expand on the huge seeds he has laid. There is some magic in the world along with Necromancers, but while it does come into play in important parts it is more about the actions that come because of certain magical interference. Even amongst the horribleness of the main characters there is something compelling about this world. It isn't merely Fantasy, but scents of something larger are in the air. Hints are dropped about the world's past even going so far as to reference city names and writers of our own past which can be perplexing at times, but you just have to go with it. Lawrence is building to something. 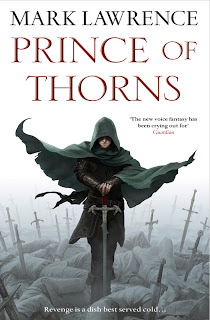 In one way I see Prince of Thorns as a simpler version of Mark Charan Newton's work mixing Sci-Fi, Fantasy, and post apocalyptic societies, but Lawrence keeps you more in the dark and in many ways reminds me of a pared down Gene Wolfe novel. It is for that reason alone I'm interested to follow this series just to see where his mind brings things. Big twists abound in a story that barely let you catch your breathe. Touted as being the next big thing in Epic Fantasy Prince of Thorns falls somewhat short, but still delivers an exciting story with a lead character you've likely not seen before. I give Prince of Thorns 7 out of 10 hats. While not wholly grabbing there is a certain appeal to Lawrence's writing that it quite catching. The sequel King of Thorns in this planned trilogy should be out in August 2012 and I'm keen to see where things go from here even if I wasn't totally won-over. Sounds like a mixed bag. I'll have to wait to hear how the second book is. I disagree with anonymous, once I heard a comparison to R. Scott Bakker, I knew this one would be worth checking out. The only thing that worries me is the blend of sci-fi and fantasy... Not a big fan of the blending of genres, but that's just me! The genre blending only comes in later in the book and for the most part isn't a huge part. But I see it being done more as the series progresses. I'm a half dozen chapter or so into this, not far; but it seems a bit off to me so far. It's ok, but I'm definitely not liking any of the characters so far. And hearing the blend of sci-fi and fantasy doesn't make me feel any better. Well I really really loved it. The book certainly seems to have outlasted most of the 2011 crop of debuts. The follow-up, King of Thorns is even better.